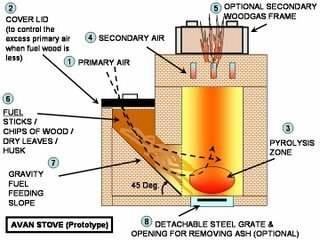 Avan (Earth) Stove http://e-avanstove.blogspot.com/ has the features of both Rocket stove and Woodgas stove. It is made up of 25 nos of ordinary bricks, four bricks with slits, one piece of flat tile, one steel grate 7x7 inches and Clay mixed with cow dung. The approximate cost of construction is $ 2 (USD). All types of biomass can be used as fuel (Sticks / twigs / chips of wood / dry leaves / grass / saw dust / cow dung cakes / paddy husk etc.) and advantage of gravity is used for easy and semi-automatic feeding. Designed by Dr. N. Sai Bhaskar Reddy, GEO -Geoecology Energy Organisation http://www.e-geo.org declared as Creative Commons.